On Sunday, October 7, 2018, Golden West College hosted its 13th Annual Chefs for Scholarships fundraising event at the college’s Student Center. This year, over $33,000 was donated to support student scholarships! 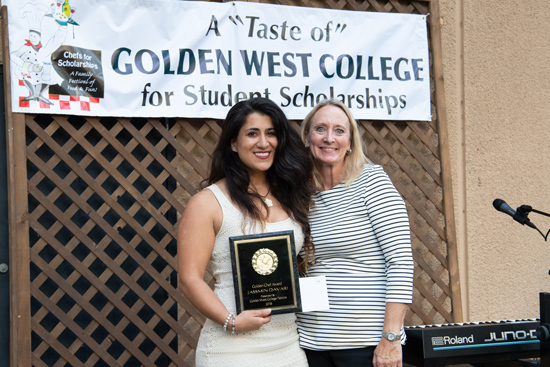 Jassmin Davari, an international student at GWC, was awarded the Golden Chef Award, a $500 scholarship given to a graduating student who demonstrates leadership on campus, and actively participates in student life campaigns and community service events. “The transition from Germany to the U.S. became easier for me than for most International students because I got involved during my first semester,” said Davari. “Being surrounded with like-minded, caring people helped me to feel a little bit more at home in America.” Davari is a member of Alpha Gamma Sigma, the International Club, and the Pre-Health Club. Over 25 local restaurants provided signature tastings for hundreds of guests at the tasting event, organized by GWC’s Foundation and the GWC Patrons. For more information on GWC’s Foundation, visit www.gwchbfoundation.com.